Therefore I take pleasure in infirmities; in reproaches; in needs; in persecutions; in distresses – for Christ’s sake. For when I am weak, then I am strong. Paul had his own ‘Job Experience‘, cataloging innumerable devastating happenings. Circumstances, that like Job’s, were designed to cause Paul to “curse God and die…” Life situations, like your own, where Satan seeks to shipwreck your trust in God. God permitted His “messenger” Satan, to buffet both his servants.. Job and Paul, and the Lord permits Satan to deliver a thorn in the flesh of all His bond-slaves.. and Paul lists the five things that made up his own ‘thorn in the flesh’ – and yours. And they are.. infirmities… reproaches… needs… persecutions… distresses… Five things that Satan utilised to destroy the faith of Job – and Satan failed. Five things that Satan used to shipwreck the faith of Paul – and Satan failed. And Paul’s cry of joy proclaims, but thanks be to God, who gives us the victory, through our Lord Jesus Christ – for Paul knew, just as Job knew that “my Redeemer Lives…” Yes- there are 5 things that Satan is using to demolish and utterly shatter Your own faith, and they are: infirmities.. reproaches.. needs.. persecutions.. distresses.. It looked as if these five things would terminate Paul’s ministering service.. just as Satan expected that these same five things to end Job’s intercessions – just as Satan aspires to curtail His work in you and in me. But Paul and Job both discovered: My grace is sufficient.. My grace is sufficient. 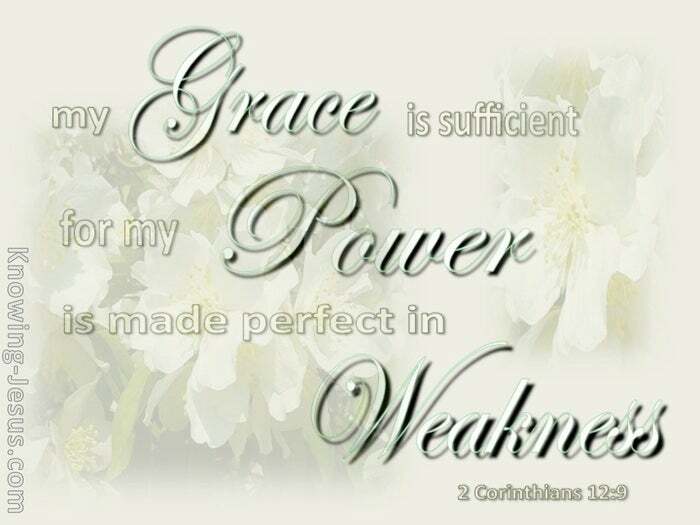 My grace is sufficient for thee… for my strength is perfected in your weakness” 2Corinthians 12:10. It looked to Paul that these five things would terminate his apostolic ministry. This was Satan’s intent in the lives of Paul and of Job – just as it is in your life, and mine. But instead these five conditions were used by God to fulfil His purpose in Job’s life. And these five conditions were used by God to fulfil His purpose in Paul’s life. 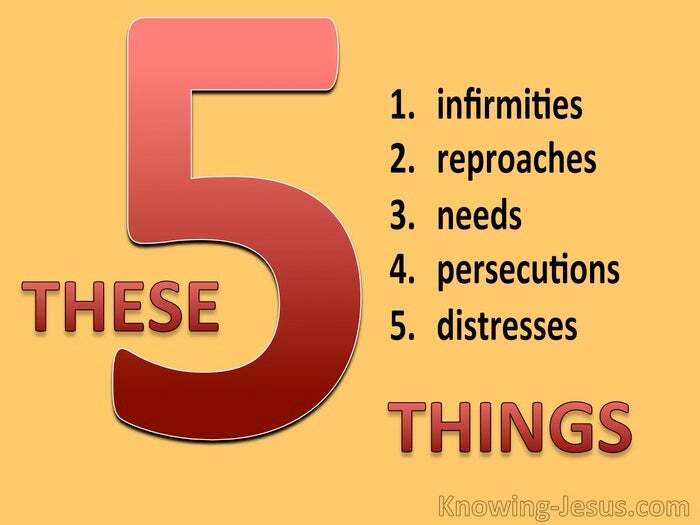 These five things removed that which was hindering Paul’s ministry. Infirmities; reproaches; needs; persecutions; distresses – were used by God – used to remove ALL that hindered the Lord Himself from living in and through Job – used to remove ALL that hindered the Lord Himself from living in and through Paul. And God will use these five things in your life too. Paul and Job eventually learned to look away from life’s circumstances – away from life’s situation and to look to Him, “The Author and Finisher of their faith..” Yes, Satan’s attacks on ALL God’s bond-servants are used by the Lord – used to remove ALL that hinders the Lord Himself from living in and through you. Infirmities; reproaches; needs; persecutions and distresses are all used by God – used to remove Job’s greatest hindrance – Job’s very own, self-worth. Used to remove Paul’s greatest hindrance – Paul’s very own, self-importance. And God may use these five things to remove hindrances in your life and in mine. The greatest impediment in Paul and Job’s lives were their own self-satisfaction. The biggest hindrance in Paul and Job’s lives were their own self-righteousness and this is the dominant obstacle in the lives of all God’s chosen vessels. These five ‘thorns’ – caused Job and Paul to become wholly dependent on the Lord – and God is no respecter of persons. What is true of them is true of all His own. When the Lord answered Job, He revealed Himself to Job in a special way. It was then and only then – after what seems like a lifetime of unendurable hurt, that Job was enabled to ‘see‘ God in the only way that God will accept… where self-worth, self-satisfaction, and self-help are of no effect to God – where self-righteousness gives way to Christ-righteousness. For I am nothing and He is All in All.